I’ve committed my life to helping local churches become known for something so communities will understand that ministries should be included in their busy lives. It’s difficult for most of us since we’ve been active in the church world for years or associated with church culture. About a third of our communities don’t have any connection or identification with a particular church. And about three quarters don’t attend church on a regular basis. The world simply doesn’t fully understand what we’re all about. If you’re known only as a church, you’re going to be ignored. Each church needs to discover a unique communication thread. A controlled message that is repeated everywhere in communications. Some call it a tagline, but it’s more than that. A thread should be a declaration of why people attend, what you’re known for throughout your ministries, and why someone in your community should pay attention to what you’re doing. You’ll need to maintain and build on this thread over years since it takes time to build awareness outside of your walls. 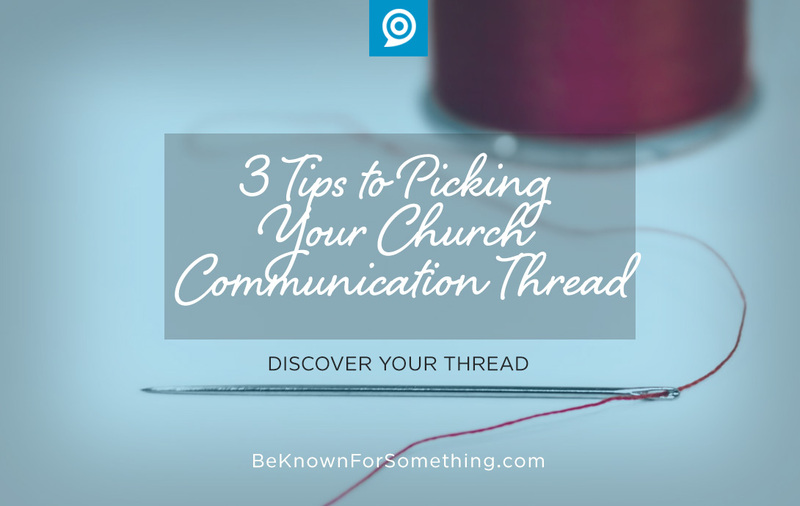 You want your congregation to have your thread concept top-of-mind when someone asks “why do you go to your church?”. Know your audience and state a solution for them. This is the obvious first step. Love your congregation and community so much that you know their needs. Think about what they’re thinking about regularly and constantly. Then think about a solution you currently offer that most would respond to. Doing this correctly makes your church needed! Don’t make it overly “religious” sounding. In your quest to offer a solution, resist religious sounding threads. Why? The people ignoring the church now will not be attracted any more. Instead, do what Jesus did at the well (John 4). He waited in a place that would attract needy people and then engaged with the woman about water (her need). Discover the temporal need in the lives of your community that you can solve. Just be sure you finish like Jesus did. After someone engages with your church, make the turn and introduce Jesus into the conversation. He alone offers the eternal solution. Just offering a temporal solution? You’re essentially a social club. Short, ambiguous, and memorable are best. Controlling the words is very important. This singular concept that should roll-off-the-tongue should be ambiguous enough so it can be used by almost all of your ministries. And possibly in different ways. This allows your congregation and leadership to use it creatively and not get tired of it. An example: My bible class uses the thread of “simple yet practical”. This works extremely well. Why? Who doesn’t want simplicity that leads to life change?! It gives a great benefit to those who regularly attend while giving a reason for someone outside of our church to want to attend.